On a sunny weekend afternoon in July, roughly a hundred protesters gathered on the Seattle waterfront. Some carried placards with images of mushroom clouds. To a jangling ukulele, two children sang a grim but catchy chorus: “Please don’t send exploding trains through our cities. We don’t think people dying is pretty.” A week after the Seattle protest, as if on cue, a Burlington Northern Santa Fe train hauling 100 cars full of volatile oil lurched off the tracks just north of downtown Seattle. There was no explosion or leak, but the derailment triggered new waves of protests across the state. 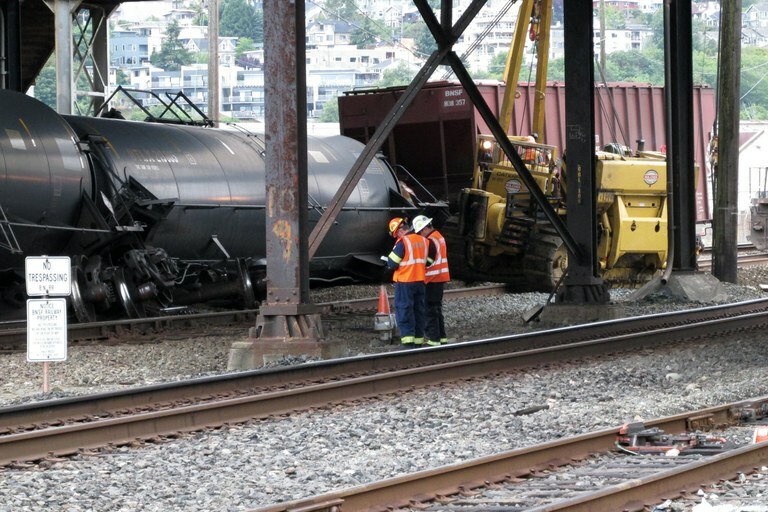 A train with 100 tanker cars of Bakken crude oil went off the tracks in northern Seattle last July. Nothing leaked from the four cars that derailed. Driven by hydraulic fracturing, or fracking, the rate of production in the Bakken oil field, on the border of North Dakota and Montana, has rapidly swamped the ability of pipelines and trucks to carry the crude to market. As a result, the nation’s rail lines are becoming essential. Between 2008 and 2013, the amount of oil traveling by rail from the Bakken increased nearly 20-fold; today, according to the U.S. Association of American Railroads, more than six out of every 10 barrels from the Bakken is hauled to refineries by rail. A sizeable portion is shipped to Washington, because it’s cheaper than sending it to the East Coast or even California. These trains of cylindrical tanker cars can be over a mile long and weigh 15,000 tons. They rattle across bridges over the Columbia River and the tidal inlets of the Salish Sea, through tunnels under Seattle and along the main streets of smaller communities. According to the state’s Department of Ecology, about 19 oil trains — some bound for local refineries and others heading for facilities out of state — pass through Washington every week. Bakken oil is a “light sweet” crude with a flashpoint close to that of gasoline. Its dangers made headlines in July 2013, when a train derailed and exploded in the small town of Lac-Mégantic, Quebec, killing 47 people and devastating much of the town. Lac-Mégantic became the symbol of the dangers of transporting oil by train, but it has not been the only serious accident. According to the Associated Press, at least 10 oil trains have derailed in the U.S. and Canada since 2008 — five in the last 18 months. One in Lynchburg, Virginia, triggered a huge fire and spilled tens of thousands of gallons of oil into the James River. Lawmakers and regulators have proposed new rules to make oil trains safer and to provide more information to first responders about their contents and routes. But the recent accidents have intensified long-simmering anxiety across the Northwest over proposed export terminals slated to send vast quantities of coal, natural gas and oil overseas. While energy companies see rail as an integral part of oil transport’s future in the Northwest, environmentalists see oil trains as incompatible with the region’s efforts to curb its carbon emissions and reduce fossil fuel dependency. The dramatic rise in oil trains can be traced to the 1980s, when freight rail was deregulated, touching off an era of cost-cutting, layoffs and the consolidation of cargo into “unit trains,” the industry term for a locomotive filled with a single commodity. Before unit trains, railroads ran on schedules, regardless of whether trains were full, says Mike Elliot, a 20-year railroad veteran and spokesman for the Brotherhood of Locomotive Engineers and Trainmen union. Under the new model, freighters travel only when they’re at capacity. Full trains running at faster speeds increase the risk of track damage, derailment and explosion, he says. In July, the U.S. Department of Transportation proposed rules mandating speed limits for oil trains and stronger brakes. It also proposed strengthening DOT-111 tankers, which carry more than 80 percent of Bakken crude and have been involved in the majority of spills and fires. But several groups representing the oil and rail industries, including the American Petroleum Institute and American Association of Railroads, have balked, arguing that the two-year timeframe to meet the DOT’s new guidelines is unattainable. Even if the cars are strengthened, many tracks, bridges and tunnels are old and deteriorating. Take, for example, the Swinomish Channel Swing Bridge, operated by Burlington Northern Santa Fe, near the town of Anacortes an hour north of Seattle. Built at the turn of the 20th century, the iron truss bridge bears the weight of trains that pass in and out of refineries on the March Point peninsula. Currently, one Bakken train a week crosses the Swinomish Bridge, delivering crude to the Tesoro terminal. If Shell is allowed to build its own rail offloading terminal, five times as many trains could cross the old bridge, increasing fears of derailment, spills or fires. In addition, Shell’s new spur line will run through the heart of one of the largest great blue heron colonies in the West. The Washington State Council of Firefighters, which represents dozens of local firefighter unions, believes local departments and communities should not have to bear the risk until the dangers are fully understood. In July, the council called for a moratorium on hauling Bakken crude until a statewide study on rail safety is completed next year. A draft of that study, released in October, found that 3 million Washingtonians live along routes where oil trains pass. Oil trains are merely the fossil fuel industry’s latest incursion into the state, says Eric de Place, director of the Sightline Institute. Last December, BP’s Cherry Point refinery, east of Bellingham, began receiving 70,000 barrels of Bakken oil per day through its new oil-by-rail facility. The refinery, 90 miles north of Seattle, sits beside the proposed location of the controversial Gateway Pacific coal terminal, which, if built, could ship 54 million metric tons of coal overseas annually. Such a project, says de Place, would swamp the state’s nascent effort to cut carbon emissions. “One coal export terminal capable of handling 50 million tons of coal alone has a carbon footprint greater than the entire state of Washington,” de Place says, pointing out that six additional proposals for new or expanded coal terminals, three new oil pipelines, and six new natural gas pipelines are also in the works. In addition, TransCanada — the Calgary-based company that’s been fighting to complete the northern spur of the Keystone XL pipeline — recently announced plans to bring tar sands crude via heated tanker cars to Northwest refineries. This story was originally titled "Flash point" in the print edition.